What is it about coil wire and the technology behind temperature sensing that makes it such an exciting new field of interest with knowledgeable Vapers? Serious Vapers are really getting into the tiniest details surrounding this topic, including the properties of the metals used in temperature controlled vaping. One of the most interesting topics is determining the various temperature coefficients of the popular wires in today’s modern coils. Really. Have you ever asked yourself how and why certain metals are chosen as wire for coils? Or how board manufacturers are able to figure out how a particular wire will perform, and how they adjust their boards for the various resistances of these wires? This article focuses on metal coefficients and the characteristics of each one used in modern coils. I will admit a slight bias toward Evolv boards, and much of this article will focus on the Evolv DNA boards, but that is only because I’ve worked with these boards much longer than I have with any other. Even so, math is math, and metal is metal. The Basic Question: How Does Temperature Control Work? Temperature Control works by simply monitoring the changes of resistance in a given coil and using these changes in resistance to estimate temperature changes. It is successful because resistance increases are linear and predictable with temperature changes, though the amount of the increase varies greatly between the different wires that are used. To that end, Kanthal wire is so widely popular because the resistance is fixed no matter the temperature at which it is used in an RDA or coil head. Temperature Control in vaping is made possible only when a wire has a realistically high Temperature Coefficient of Resistance (aka TCR). This Coefficient has a mathematical value that specifies how much resistance will rise for any given temperature increase, relative to its starting resistance of course. When the coefficient is said to be ‘high resistance’ it will increase as the temperature increases. When the coefficient is low the resistance rises only a negligible amount. Nickel, or Ni200 (pure nickel) was chosen by the company Evolv (famous for its DNA chip boards) as the first Temperature Control wire because it has one of the highest coefficients among the more common metals. Kanthal has an extremely low coefficient – the resistance of Kanthal hardly rises at all, even with massive amount of heat. As a wire for vaping coils this is an enormous benefit. At the same time, it also makes Kanthal wire utterly useless for Temperature Control coil builds… so far anyway. We may soon see a TC device that works with Kanthal by the end of 2016 or early 2017. The TCR (temperature coefficient resistance) is always relative to the starting resistance. This means that the higher the starting resistance of a coil, the greater rate of increase in resistance with temperature. For instance, a low resistance of, say, 0.10Ω coil when heated hundreds of degrees will only increase in its resistance by a few tenths, while a 1.0Ω coil heated the same amount will increase by several ohms. The TCR of pure Nickel (Ni200) is about 0.006. That means that for every °C hotter a Ni200 wire gets, its resistance rises by (0.006 * <starting resistance>) Ω. Follow? So for a coil that starts at, say, 1.0Ω, every degree °C of heating will increase its resistance by 0.006Ω (0.006 *1). For a coil that begins at 0.1Ω, each degree will increase the resistance by 0.0006Ω (0.006 * 0.1). In the following examples I am using the least troublesome numbers to prevent being overly complicated. The equations are what’s important anyway, know the equations, or have them at the ready when needed, and you’ll be able to work out any variable. The temperature control board is performing these calculations several times per second, and is always monitoring the temperature and making adjustments to the power as needed. Temperature Control vaping with other wire materials is inaccurate by default (but certainly not impossible), unless the TC-Mod allows for the coefficient to be adjusted to suit the particular wire. I’m not saying that you cannot attach a Stainless Steel coil to your RDA and vape with any DNA40 or DNA200 board, I’m just saying that for now, only Nickel wire will be accurate. So, what wire materials, besides Ni200, could be used in coil building for temperature sensing purposes? The coefficient of Titanium is 0.0035, or just over half compared to Nickel, which is 0.006. Titanium is used in many sub-ohm tank coil heads and as a wire for DIY coil builders. 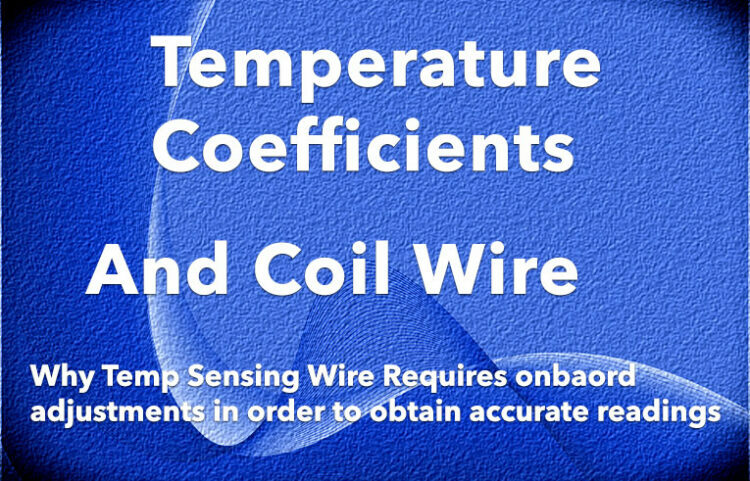 In order to work with Ti wire in a TC Mod it requires a temperature offset of around 90°F. In other words, you would set the temperature to 400° when you wanted 490°. However, with a corrected coefficient this would no longer be a problem… the real desired temperature could then be set with confidence. The advantages of Titanium over Ni200 are many, including being able to build micro coils and to make contact with individual coil wraps (not spaced as you would with Ni200 coils) as well as higher resistance ranges. Titanium is also stronger than Nickel, so it won’t break easily like Nickel does. The significant downside to Nickel wire is that it’s springy until it is torched or pulsed. Another advantage of Ti over Ni200 is safety; most scientists that work with metals classify Titanium as being primarily safe, perhaps even more so than Kanthal. Still, vaping is in its infancy, and it’s a little too early to say with certainty that any vaping wire is completely safe. Stainless Steel has a coefficient of 0.00094, less than one-sixth that of Nickel wire. This means that Stainless Steel cannot be properly used for TC without adjusting its true coefficient – its resistance increases with temperature is way too slight for normal TC mods that are set to use Ni200. Stainless Steel coils were introduced only recently but have seen fast adoption rates nonetheless. There are a lot of positives to using Stainless Steel wire for building coils. Some vapers can use 304 SS (Kitchen grade SS), but as a builder of coils I want Surgical Grade SS, otherwise known as 316 SS. If you choose Stainless Steel for your own coil building or as the wire in the coil head of your favorite sub-ohm tank, take note that the Stainless Steel should be 316-grade. Stainless Steel has almost no ramp up time. Click the Fire button and the coils just light right up! Stainless steel is also naturally low resistance (though not super low like Nickel). Some coil builders are beginning to refer to Stainless Steel as The New Kanthal because of it’s low resistance, malleable features and it gives a clean(er) flavor. Stainless Steel does offer great flavor with no metal taste, something I can’t say about Titanium, and that is a major plus with me personally. The advantages of working with Stainless Steel versus Nickel (Ni200) are the same as for Titanium, namely, building of micro coils are much easier, and Stainless Steel coils can make contact with each other. It also has higher resistance ranges, and it is stronger than Nickel. The advantages of Stainless Steel versus Titanium is that it’s much easier to work with. It nicely malleable and very easy to wrap. It is also cheap. This peculiar sounding wire has a temperature coefficient is 0.0032, which is very similar to Titanium wire. I don’t have any experience yet with this wire, but it is said to be easier to work with than Ni200, though I’ve heard nothing on how it compares to Stainless Steel or Titanium. Its resistance at 29G is 5.5Ω/metre, less than Titanium and Stainless Steel but 4 times more than Ni200. Its usable up to 600°C (1112°F, unquestionably a much higher heat ceiling than Nickel. Right now it only exists in one size – 0.28mm/29G, and, I’ve read that that may be the thickest that will available for quite a long time. Before we see a multitude of gauges this wire will have to catch on with coil builders in significant numbers. Before researching various materials being used for coil wire earlier last year I had no idea that any temperature sensing board had to deal with adjusting coefficients when it came to delivering accurate temperatures in TC mode. Nor did I realize that these adjustments are based on the difference in resistance from Nickel wire. Afterward, it began to make sense and the Evolv DNA 40 board’s achievement began to take on a new, higher sense of respect for being able to utilize Nickel in the way that it has. Once other manufacturers began creating their own temperature control boards it was just a matter of dealing with wire properties to get accurate performance. Each wire has its own characteristics and I’ve learned that my sensitivity to titanium wire, that funky metallic taste I can get with certain e-liquids, is more common that I thought, but nowhere near a majority. After using 3 of the 4 wires in this article I can honestly say that Stainless Steel would be my choice to use in a TC mod, but because I like the Evolv boards as much as I do, I’m hoping for a firmware upgrade that will deliver more accurate temps with Stainless Steel. Otherwise, I’ll stick with Ni200 just because the entire temperature sensing technology was geared to the properties of Nickel wire. Update* January 30, 2016 – Since I wrote this piece I have gained even more respect for Stainless Steel coils. Joyetech, eLeaf and WISMEC in particular have released several new TC mods that can accommodate several metals, including Kanthal, Ni200, Titanium and Stainless Steel. I’ve been using more SS coil heads in sub-ohm tanks and I’ve found SS to be an excellent metal for true flavors of the eliquid in use, as well as accurate temperature sensing. With new boards from the aforementioned companies, and Innokin’s work with the IKANI chipset, the DNA boards from Evolv needs to ‘evolve’ sooner rather than later. I’ve been asked more than a few times why I did not say anything about Ni-Chrome 80, and I’ve address that with this Knowledge Base article HERE. My “opinion” of Ni-Chrome 80, as well as Ni-Chrome 60, is simply my opinion. I avoid Ni-Chrome wire regardless of its history in the vape world because this compound doesn’t perform anywhere near as well as Kanthal A-1, and it’s useless for Temperature Control Systems. So why bother? Read the article (it’s brief) for more.